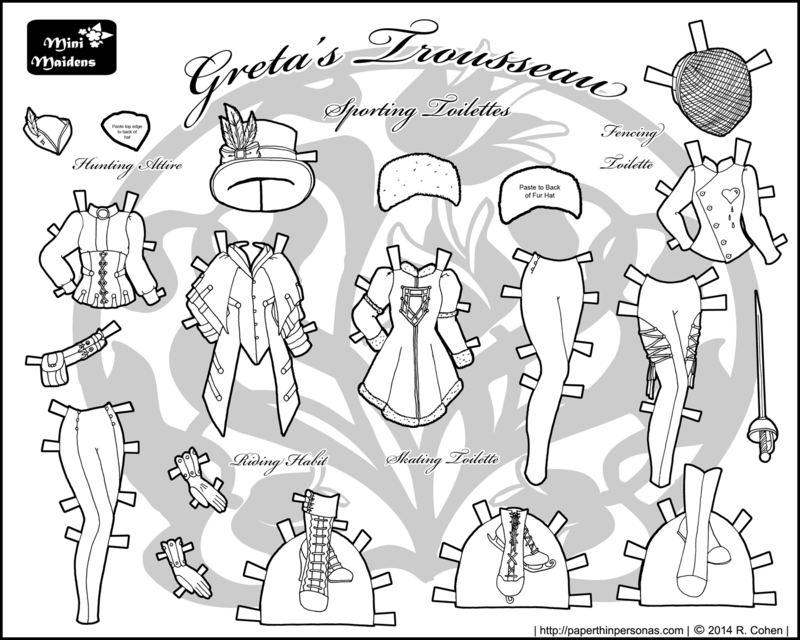 I really did not think I was going to get a Halloween paper doll done this year. 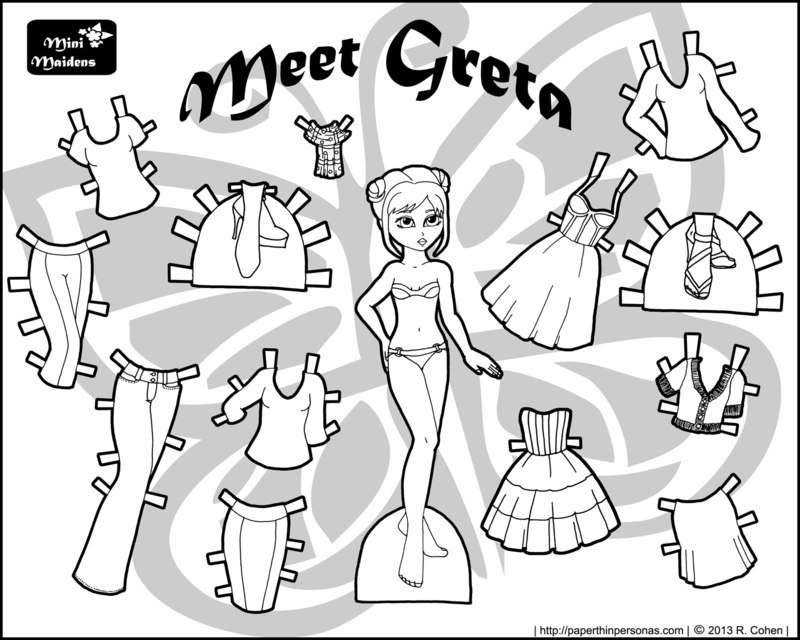 I was certain I wouldn’t and then I was going through my logs and I noticed that I have done a Halloween paper doll every Halloween since 2010. Over the years, there have been a vampire, a costume set, another vampire, and a collab between me, Boots, Liana and Toria. So, that’s a lot of Halloween paper dolls. This Halloween, we have a ghostly Greta of the Mini-Maidens. 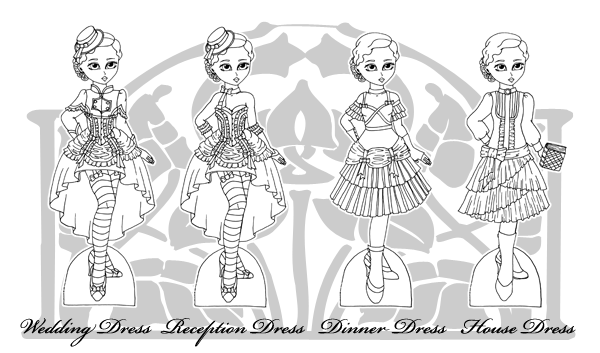 I do a lot of Mini-Maiden paper dolls for holidays. I think because they are black and white and I can get them done quickly. I often forget about holidays until they are upon me. 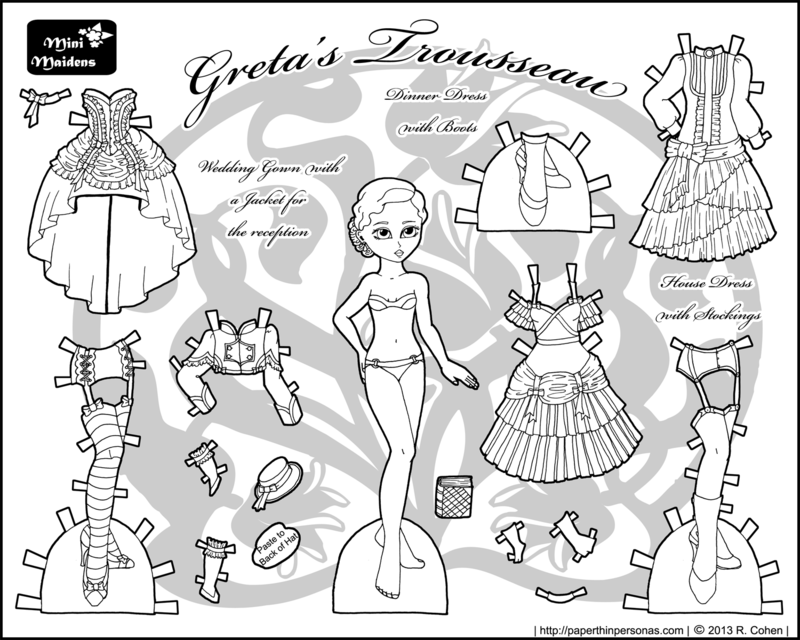 I created this paper doll set thinking of ghosts and the idea of ghostly women. They exist in all sorts of cultures. White Lady ghosts are from Europe and usually have been betrayed by a lover. The Leanan sídhe is less a ghost and more a fairy, but according to Celtic lore they inspire their loves, but also induce madness and early death. In Japan, there are the Onry? vengeful ghosts of women wearing white marriage kimonos with long unkempt hair. They appear in a lot of Noh theater. Anyway, I was channeling all that when I created this paper doll set. I made the set for Greta, because she hasn’t gotten a set in a while and I thought she needed some love. Also, it was an excuse to draw some flowing gowns. I imagine the stuff on her feet is blood, but you can color it anyway you wish. 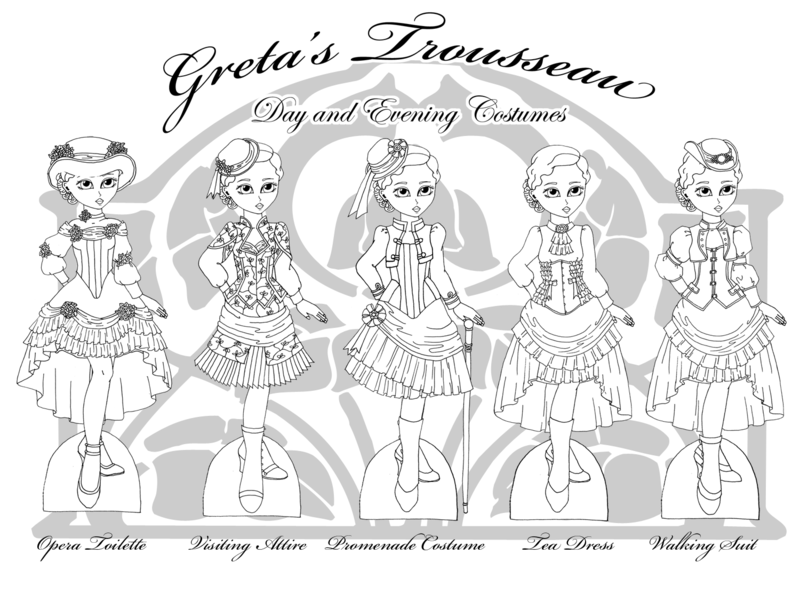 This is the first part of a multi-part paper doll project to create a neo-victorian or steampunk paper doll bride with a trousseau of outfits for every occasion. 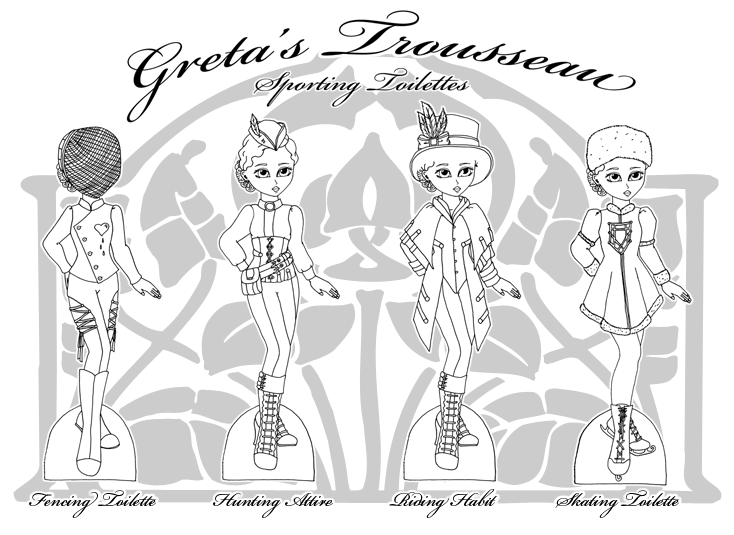 I feel like I’ve written before about my love of the idea of a trousseau. I remember as a child I was fascinated with the idea of having different dresses to do different activities. 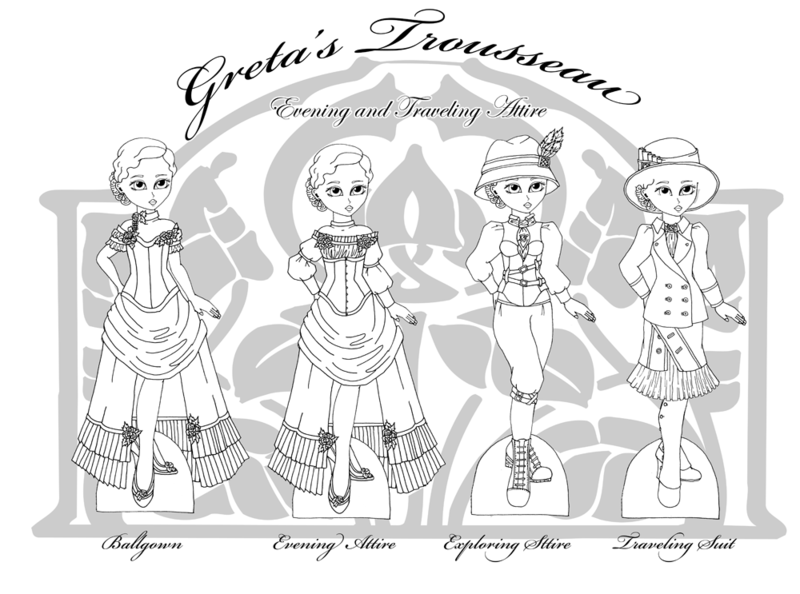 I wanted to tea dress and an afternoon dress and a morning dress. This all seemed very exciting to me. 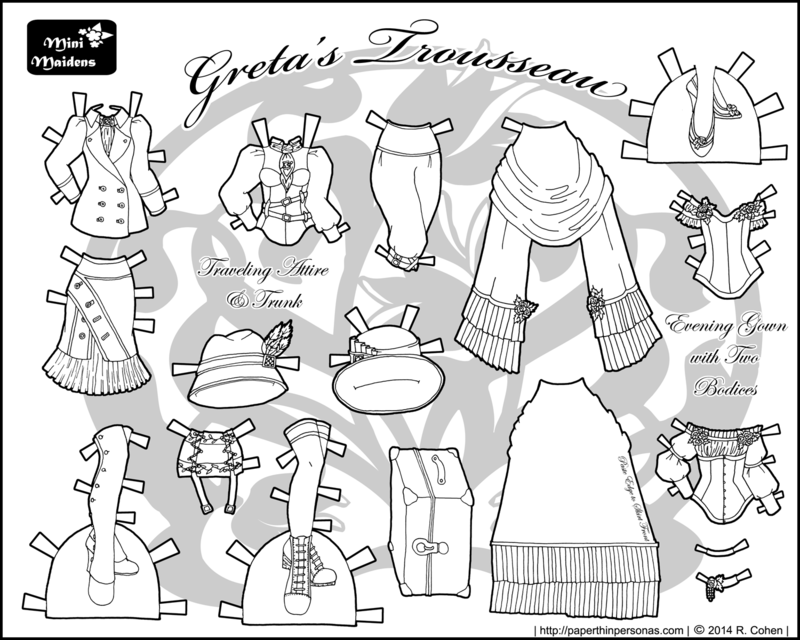 I’ve never given up my love of trousseaux or layettes or wardrobes and each time I do a paper doll, particularly a mix and match paper doll, I think about how each of the pieces can go or can’t go with each of the other pieces. Clearly, this is going to be a larger project than just this post. 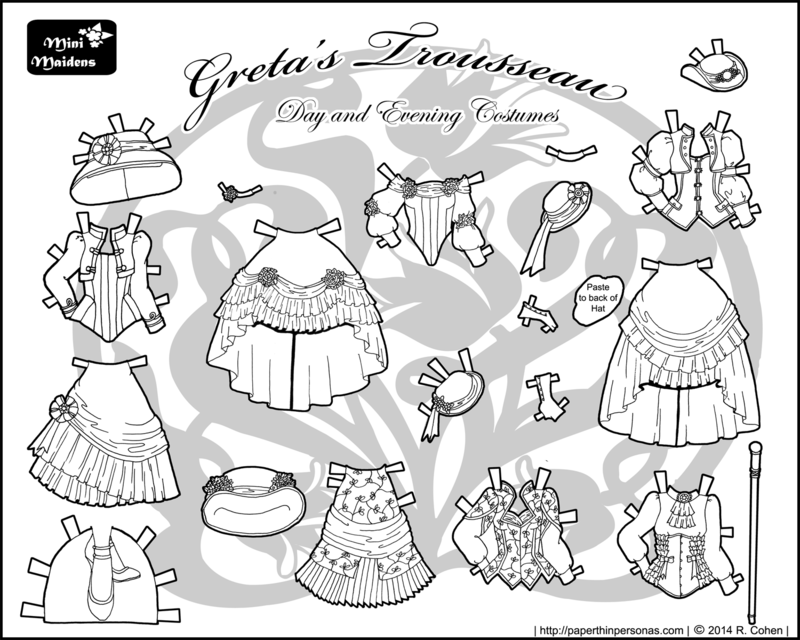 This is the first of what I suspect will be several pages of trousseau for Greta. We’re starting with her wedding dress, with a jacket, a dinner dress and a house dress. The wedding dress could become a ballgown quite easily and that wasn’t an uncommon practice, because wedding dresses were often simply a women’s best dress. The dinner dress is more of a semi-formal dress, a step below a ballgown and right around the world of an opera toilette (don’t worry, she’ll get one of those two). Her house dress is, of course, the least formal with a book to read while she spends time at home. Ever stylish paper dolls need to relax sometimes.